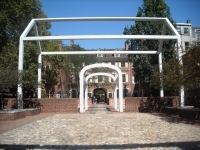 The part of the Independence National Historical Park between 3rd and 4th Street is where the home of Benjamin Franklin once stood. While the actual house no longer exists, a 54-foot-high (16m) steel skeleton ghost structure covers the remaining courtyard. It provides a novel and fascinating tribute to the life of Franklin, allowing great insight into the iconic former statesman. His many vocations included printer, diplomat, inventor, publisher, author, and postmaster, as well as the founder of the University of Pennsylvania. Visitors can peruse an underground museum filled with paintings, objects, and inventions associated with Franklin. There is a bank of telephones with many testimonies from famous personalities about the achievements of the great man. There's also a US Postal Service Museum and a nearby home displays an architectural exhibit explaining Franklin's fire-resisting building techniques. Another building houses an 18th-century printing office and bindery with demonstrations. Alongside sits the restored office of the newspaper published by Franklin's grandson Benjamin Franklin Bache.